This scene takes place around the turn of the century when Bay lighthouses were manned by vigilant keepers and most vessels were powered by the wind. The keeper, along with his helper, would spend weeks on lonely and hazardous duty. 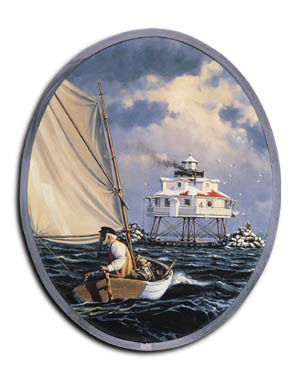 A tribute to the lighthouse keeper, seen here returning to Thomas Point Lighthouse from a visit to Annapolis, Maryland, is depicted in brilliant stained glass in John M. Barber's art entitled "Return of the Keeper." Built in 1875, Thomas Point Lighthouse was manned until 1986, when it was automated. It continues to serve mariners on the Chesapeake.